In the afternoons I have been "following" a different kid from school home. The kids are starting to come up to me after school and ask if I will come to their house! Most of the kids in Peredo live fairly close to the school. 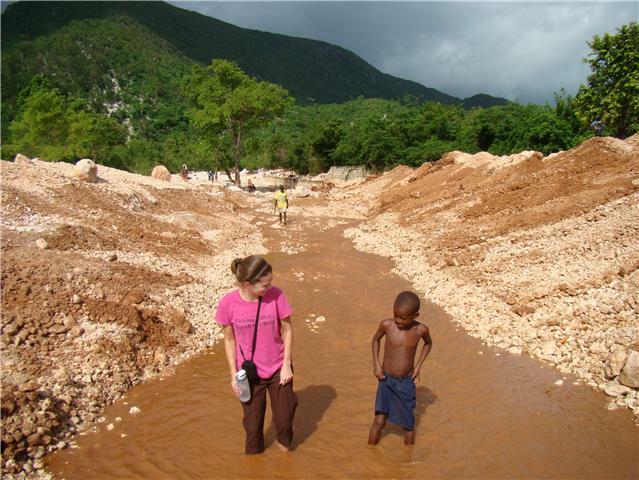 At HCO's (Haitian Christian Outreach) school in Seguin, some of the kids walk 4 miles to school. While we are walking I talk to the child and usually our number increases in size as we walk through the village as other kids want to walk with us. When we get to the house I meet the mother or mother figure if she is home. Sometimes she is out doing laundry, sometimes at the market working, and sometimes she is at home cooking, cleaning or talking with her friends. I practice my Creole with the family and am always given a seat. The Haitian people are very hospitable. They get a chair (even if they only have one) and insist that I sit. They usually offer something to eat or drink but being as I don't want to get sick I usually tell them that I just got done eating. It amazes me that these people who have very little-offer a guest everything. I lose track of time sitting and talking with these families. I am trying to collect information for myself on how the kids in our school live. We have done some health teaching with them already and I hope this continues in the future. I want to see the resources they have at home so we can see what types of health promotion teaching would improve their health. For example, one of the teams that came down last month gave every child in the school a toothbrush and toothpaste and we did teaching on how to brush your teeth and how often. So when I visit their house, I ask the child to go get me their toothbrush and toothpaste. I can see where they keep it, if they still have it at all, and if it looks like it's being used. One house was using the toothbrush as a dish scrubber! So if I would have asked the child in school if they were using their toothbrush, that student could have said yes (technically it was being used to wash dishes!). One of the things I am learning about the Haitian culture is that I have to very specific when asking questions! I also ask to see where the family how far they walk to get their water, how do they store it, where they go to the bathroom, where they store their rice/food among other things. This is giving me a better picture of where the school kids are coming from and what health teaching is important for this specific community in Peredo. I am also getting to know the families in this community. I am praying this helps establish a bond of trust. Of course when I am walking back I have to stop at my friend Kait-la's house. I talked about her in one of the other blogs. She's the spit fire 5 yr old that I absolutely love! The other day I took her a couple of shirts and a few toys and gave her grandmother some soap and lotion. Kait-la was so excited about the clothes that she stripped down in the front yard and tried them on. Her grandmother told me that Kait-la looks for me everyday. What I didn't say was that I look for her everyday too! note-I haven't taken pictures when I go out to meet these families. I am trying to be sensitive and think of how I would feel if someone came to my house in the US (who couldn't speak English that well) and asked to take pictures. More pics to come soon!